WEMPE thermometer/hygrometer ready for order! The marine instruments of WEMPE also exist as combined thermo- and hygrometer. You can read temperature and relative humidity on one clock face and don't need to purchase a second instrument. Almost all product series of the traditional German company include such thermometer/hygrometer combinations. For example the NAVIGATOR models that are produced from solid aluminium or the PILOT Series with their minimalist designs. In close to all cases you have the choice between different types of housing, such as colourlessly lacquered or chrome-plated brass or matt nickel plated. 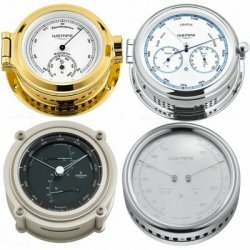 Particularly unique versions of the WEMPE thermometer/hygrometer are the combinations of barometer and quartz clock. The instruments are therefore embedded in fine wooden boards for the exclusive look. The ADMIRAL II Series also includes a thermometer/hygrometer combination with blue enclosure and white clock face. Black clock faces are available in all product series.